Igor Kurganov Wins €25,000 High Roller (€1,080,000)! Igor Kurganov has done it folks. After defeating a stacked final and battling with one of the best players ever to live, Daniel Negreanu, Kurganov has scooped all the loot and will be the man with his name on the trophy. For his win, Kurganov scores himself a cool seven-figure score worth €1.08 million and a massive European Poker Tour title. 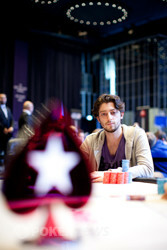 Kurganov has had an amazing season on the EPT, especially in High Roller events. This season alone he's earned a third-place finish in the EPT Tallinn €10,000 High Roller for €40,450 and a second-place finish in the EPT London £20,000 High Roller for £318,300. And this season doesn't even include the second-place finish he scored in the EPT Grand Final €10,000 High Roller Turbo last season in Madrid where he won €123,000. Entering the final table, Kurganov already had just shy of $900,000 in live tournament earnings. Now he's got over double that and locked up a major win under his belt, but it wasn't easy. Although Kurganov entered the final table second in chips, he had quite the onslaught of opponents to battle through. When play got down to the final four, Kurganov fell to the bottom at times, but never gave it. He stuck to his guns and battled his way to heads-up play against Negreanu. When the match began, Kurganov was down over a million in chips to Kurganov, but the focus and determination was there the entire time. Thanks to some timely spots and solid play, Kurganov took the lead and kept Negreanu chasing for a good amount of the match. 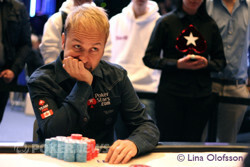 Negreanu grow shorter and shorter, but didn't give up either. Eventually, he was a bit too short and moved all in with the . With just about six big blinds, Kurganov was basically forced to call him with the . Kurganov spiked a king on the flop and held from there to take home the title. Negreanu's second-place finish earned him his second six-figure score of the week, this time for €598,600. Earning this score has vaulted Kurganov up into the top 10 on the Russian all-time money list and ahead of Andrey Pateychuk for seventh place. He's still got a ways to go and a few more millions to win if he wants to be on top of that leader board, but by the looks of it, he's on the right track. Congratulations to Kurganov and also to the other winners for their efforts. As for PokerNews, that wraps up our coverage from here in Monaco for the PokerStars and Monte-Carlo® Casino EPT Grand Final. 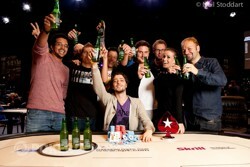 It also wraps up our coverage from Season 8 of the EPT. It was another very, very successful one and we can't wait until Season 9 kicks off in Barcelona in August. Until then, stay tuned to our live reporting pages for coverage of events from all across the globe. We'll see you next time! Now that's how you take a winner's photo! Thanks as always to the amazing Neil Stoddart from PokerStars for the photos. Igor Kurganov raised to 200,000 and Daniel Negreanu made the call. The flop was and Negreanu bet 150,000; Kurganov called. The turn card was the and once again Negreanu quickly bet, this time for 225,000 and Kurganov called. Negreanu bet 350,000, leaving 540,000 behind, and just stared down at Kurganov. "I am all in," said Kurganov. No sooner had the words left Kurganov's mouth, Negreanu erupted in his chair, "F***… how sick… how do you ever not have a straight now… I am not going down like this," said Negreanu has he folded his hand. The crowd were baying for Kurganov to show a bluff, but he would only oblige by showing the lone . Then in the following hand, with only 6BB remaining, Negreanu moved all in and and was called by Kurganov. "Really? 6BB and you find a hand like that?" Said Kurganov. The two players got to their feet and the crowd lurched over the rail. This was it… you could sense it. "Put a queen of clubs on there," said Kurganov. The €25,000 High Roller is over and the champion is Igor Kurganov who takes home a cool €1 million. 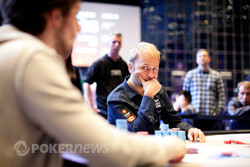 Commiserations to Team PokerStars Pro Daniel Negreanu who finished in second place for €598,600. How Is It Not Over? Igor Kurganov limped in from the button and Daniel Negreanu checked his option in the big blind so that the dealer could run out the flop. Negreanu checked and Kurganov bet 100,000. Negreanu called. The turn paired the board with the and Negreanu checked. Kurganov checked behind. The river was the and Negreanu checked. Kurganov bet 300,000 and Negreanu just called. Kurganov showed the for a full house, fours full of eights. Negreanu showed the for trip eights and lost the pot. "How is it not over?" questioned Kurganov when he saw Negreanu's hand. Philipp Gruissem was standing by watching and his jaw was on the floor when he was saw what had happened. From the button, Igor Kurganov raised to 200,000. Daniel Negreanu made the call from the big blind and the flop came down . After Negreanu checked, Kurganov bet 240,000. Negreanu check-raised all in and Kurganov snapped it off with the . Negreanu held the . The turn was the and river the , leaving Negreanu second best. Kurganov was all in on the flop for 2.13 million and doubled to over 4.6 million. Daniel Negreanu not giving up without a fight. This match-up just doesn't want to end. Igor Kurganov raised to 160,000 on the button and Daniel Negreanu made the call. The dealer dealt and both players checked. Fourth street was and Negreanu bet 215,0000, a bet that was called by Kurganov. On the river we saw the and Negreanu had just 730,000 remaining. "I'm all-in," said the Canadian. Kurganov spent the longest time in the tank yet, before eventually calling. "I have an eight," said Negreanu. So Kurganov's ace high call was no good and we are back to even steven. Igor Kurganov raised to 160,000 from the button and Daniel Negreanu called from the big blind to take the flop. Negreanu checked and Kurganov bet 180,000. Negreanu called. The turn was the and Negreanu checked again. Kurganov stayed on the gas and fired 400,000. Negreanu called. The river was the and Negreanu checked with a little over 1.3 million in chips behind. Kurganov fired 680,000 and Negreanu went into the tank. He eventually folded and Kurganov won the pot to move over five million in chips. Kurganov now has nearly a four million chip lead. From the button, Daniel Negreanu raised to 160,000. Igor Kurganov called from the big blind and the flop came down . Negreanu bet 160,000 after Kurganov checked. Kurganov check-raised to 440,000 and won the pot. Daniel Negreanu raised to 160,000 on the button and Igor Kurganov called from the big blind to see the flop come down . Both players checked and the turn was the . After Kurganov checked, Negreanu bet 250,000. Kurganov folded and Negreanu won the pot.